i just placed my pre-order for 2 copies with Amazon. nice title. good description. you might want to re-consider the cover design. Great :o) As I said, I had nothing to do with the cover. "I also interviewed Howard Bear and Gerard 't Hooft, but the two didn’t make the final cut and only appear in a short sentence each. I swear, throwing them out was the hardest part of writing the whole book.… You don’t have to wait for the book’s content to appear on this blog, it won’t happen." How about a few (other) choice snippets from Howard and Gerard to help us through the 7-month wait? Or is their other stuff already on your schedule for something else? You sound pessimistic about the reception of the book, but I would remark 2 things. The right Zeitgeist may not be here yet, but it will come at some point in the future, for the brave and the patient. As for the present, I have a sneaking suspicion that there is an undercurrent among younger physicists concurring with your views. Hopefully they will become more brave aswell due to a.o. your efforts. As a long-time lurker: I love your blog! The only post of yours I ever disagreed with was your post about: "No, we probably don’t live in a computer simulation". we can put this abstract argument aside safely, because universes with weird logic probably cannot be discussed using the logic of our universe. • Physics: Even assuming universes with matching logic, your argument also appears to assume that somehow the higher level universe has to be using the physics of the simulated universe (ours). Why does that have to be so? Why cannot a universe with no entropy and vastly superior computing power run a 'lesser' universe with 'worse' physics and simulate it to within the error bars of the uncertainty principle? Could the uncertainty principle itself, combined with the quantization of most metrics in physics be a clever method to limit the amount of computing required to simulate us? the proving of any simulation inaccuracies via measurements more difficult. unobservable in the simulated universe. So no, we don't "have to" use qbits to get quantum mechanics. If they are competent we'll never be able to tell. It is probably to late to change the title, but I get the feeling that lost in math, and the beauty criterium do not cover the package you want to get across. There's a lot more going on, as you indicated in your post.
" The unbearable lightness of modern physics "
as in lacking new foundations, causality, motivation, relevant constraints etc. Sound a bit more iconic too, no ? I'll throw in a free redesign for the cover, I know how that is done. Or better yet, couldn't you propose doing that yourself, you've got the skills for it. Make a fist, get what you want, that's my advice. Congratulations! I'm sure it's an important book. The comment on Amazon is far too black&white, and I don't think it reflects the more refined and nuanced views you are going to bring forward. Is that fair to say ? You should have the opportunity to write that yourself, or at least have a hand in it. Their principle behind cover design is that they should be specific to the genre, so people can recognise what the book is about. So they make your book look like Lee Smolin's cover as that book had a similar theme, dark and serious. Foreboding. The cover of Lee's book was a squeaky blue-and-orange. Besides, I sincerely doubt the existence of any such principle as you mention. Thanks for your advice on the cover and on the title, but I have reason to believe I know better what the book is about than you. This comment is off-topic and I do not want to pursue this discussion here. Let me just say that what you write is wrong. I have not made assumptions about the higher-level physics and it could as well obey different kinds of logic. Yes, you could stop the simulation, but then you'd have to count "consciousnesses per time" instead if you want to speak about the likelihood of us being simulated. Is there a Kindle version? Constantly Thinking ... says he's pre-ordered one but there is no reference to anything other than the hardback when I look at the Amazon.com page you linked to. They wouldn't sell me a Kindle version anyway (I have to buy in the UK) but they are still normally displayed if one exists. The British rights haven't been sold. I placed a pre-order with iBooks. Looking forward to reading it. There were a couple of versions of Lee's cover. Mine's black. Just pre-ordered the book via Amazon's 1-click feature. 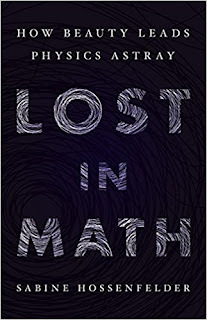 In the meantime I have a pile of books on math and physics, that I'll be working my way through over the fall, winter, spring that should give me some background preparation for reading Sabine's new book. Almost became a co-author of a book on UFO's, with my twin brother, a subject that has fascinated us since our early teens. At the last minute he decided to go it alone, so my chapters have been collecting dust for some years now. Might just try to publish my own section, though it's a formidable effort after seeing what my brother went through. However, my brother will help me out if I decide to do it, as he's already gone through the whole, complex process. Of course I will read your book! But what is "phenomenology" in a physics context, I think continental philosophy has a prior claim to that term? Lastly, the problems you allude to and have written about (naturalness for on) would seem to make you and Lee Smolin allies. Do you know him? Sabine, did you (or why didn't you) interview Juan Maldacena? Best regards. We can spend the next 3 years with you asking "Why didn't you interview X" and me shrugging shoulders and no one will learn anything from it. I think the people I interviewed give the reader a pretty good picture of the community. Phenomenology (in science) is the bridge from theory to experiment. I explain that in the book. And no, it has nothing to do with the area of philosophy that goes by the same name. I also explain that in the book. Just pre ordered the Kindle version. Too bad we have to wait so long for an electronic book that is already finished. The Amazon page your link took me to gave three options including Kindle (a previous commenter said he did not see a Kindle option - I guess that's a regional issue). It's not finished - I haven't received the copy edits yet and the figures aren't done. Pre-ordered the Kindle version. Also looking forward to hearing what you have to say to Natalie Wolchover next month. "Phenomenology (in science) is the bridge from theory to experiment." Theory derived from a non-empirical postulate excludes postulate-falsifying experiments that contradict accepted theory. GW170817 binary neutron star merger plus 1.7 second delayed gamma-ray flash over 130 million lightyears path falsified several non-classical gravitations. Are they abandoned? 4.6 light-seconds solar diameter. DOI:10.1038/nature24048 (no paywall) Hadronic matter and antimatter are parts-per-billion indistinguishable. Baryogenesis remains unsourced? Sounds fantastic--can't wait to read it. Also looking forward to seeing you and Natalie Wolchover at NYU next month. Just pre-ordered the Kindle edition. Looking forward to reading. Did the Dirac equation become useless or did it describe pieces of the process where electrons interact with photons which can split in electron-positron pairs then annihilate back to photons? I don’t understand the bridge between unified elegance and a never-ending set of messy diagrams. Thanks. Wow, great, I look forward to reading it! Congratulations! With your worries about tenure, etc. I sense that you almost feel you have to apologise for being a sceptic. The reality, I believe, is the opposite. It is those who have raised so-called "fundamental" physics to new heights of untestability that should be apologising. In any case the public, and by extension, the grant-giving bodies cannot be fooled forever. Sooner or later funding is going to be cut and it would be as well to be out of it when that happens. Congrats Sabine! I had no idea you were writing a book and I am looking forward to picking up a copy. Will you be doing any promotional events at FIAS to celebrate its release? At FIAS? I dunno, if someone is interested, sure. But the book won't be published in Germany until fall 2018. Dear Sabine, Thank you, I am looking forward to reading your book. I studied economics. A similar "Lost in Math" phenomenon occurred in that field when physics envy took over. Nobelist Paul Krugman described in his essay "How did economics get it so wrong?" from 2009 following the crash, especially his first section "Mistaking Beauty for Truth". I wonder if you see a parallel? I am sorry to read that you sacrificed gaining tenure by publishing this book. Wny is that so? Regarding tenure. The game you have to play to get tenure is to convince a committee that you will do more of what they're already doing at that place. You don't get hired for criticizing others. It counts for nothing in the best case, and against you in the worst case. But please don't misunderstand this, I'm not complaining. I am happy doing what I'm doing because I feel it's the right thing to do. I just meant to say I have debated back and forth with myself for a long time whether I should publicly denounce most of the research in my field as nonsense. It would have been easy enough to write a book about something else, you know, the usual science cheer leading stuff. But it's just not me. Looks very interesting and the subject is important. I think I will read the book. @RobP 1997 Nobel Prize/Economics to Black, Merton and Scholes for arbitrarily small risk investment. It was not scale-independent. Centrally administered economics fails, Tragedy of the Commons rather than contained appetite or personal sacrifice for team victory. 50 years of non-classical gravitations are empirically sterile. Test not suppress the boojum causing global glitches. It's just that non-renormalizable couplings are very likely suppressed by about the grand unification scale. That's all it is. Only the Higgs and nothing else, is actual a beautiful confirmation of what we already expected. I believe Howie spells his name "Baer". Would definitely prefer "maths" to "math" in the title. Looking forward to reading it! I really do appreciate your work. Several years ago, I decided to check up on the current state of physics, and as I said a few days ago, my first reaction was that the Emperor Has No Clothes mixed with quite a bit of the Wizard of Oz. Obviously, I didn't trust what I was reading, but I do trust what you say. That doesn't mean I always agree with your perspective, but rather you don't come across as the Wizard of Oz, and so have much more credibility about physics than a lot of things I've read lately. You're clever, independently minded and possessing a healthy iconoclastic approach to your field. These are necessary attributes for tenure in many institutions. Were someone like you to apply in in my field, I'd support that person's application. Do you plan on releasing the excluded interviews on a popular magazine or website? No. In fact I can't because I don't have permission. Do you also belong to the theorists that are lost in math, or do you have the solution? 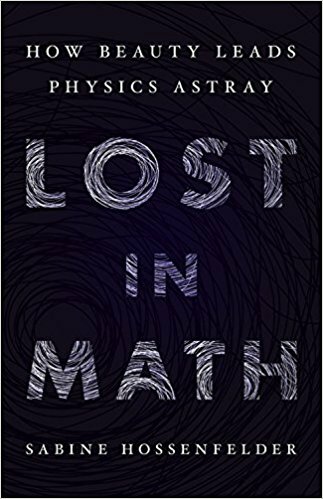 The title of the book refers to assumptions that get "lost in math", not to people, though certainly I also used it to sum up my own story. I have some suggestions in the book for how to improve the situation. Whether these are solutions, only time will tell. An interesting thing about the tenure system is that it's original purpose is to convey a sort of intellectual freedom to a faculty. If you've demonstrated that you can teach well and are productive, you get tenure and some freedom to research what you want and think (aloud) what you want without worrying so much about job security. Well, I think that was the original idea. It's never been without its problems. I taught physics for a little while at a college that did not have a tenure system. A colleague was researching it at the time in an effort to reinstate the system there. It turned out that the college had abandoned tenure during the Vietnam war, for obviously political reasons. Anyway, I'm very much looking forward to your book! Will there be a Kindle version? Yes, there will be a Kindle version. I have long had this thought in my head that equations (maths), are not 'real science models'. Recently discovered a Cosmologist called Wallace Thornhill who specifically called that out. 'Mathematics is NOT science.' Should I understand that this is NOT the gist of your book, but rather that theoretical assumptions can be lost in the Math ? Depends on what you mean by 'science'. The German use of the word ("Wissenschaft") is close to the Latin original "scientia" meaning, essentially, knowledge. Mathematics is knowledge, hence in German it's a science. In the English use of the word, maths does not belong to the sciences. I don't know why. I'm not sure it's an interesting question to discuss, and in any case, I'm not a linguist. Having said that, leaving aside the meaning of words, math along isn't sufficient to describe nature because you also need an identification of the mathematical structures with observation to make a theory. I'm sorry if this isn't the most appropriate place to ask, but will there be a hardcover version in Italy in time for when the book comes out? No Italian publisher has signaled interest in publishing the book, hence there is no Italian version in the planning. Have also ordered two copies of the hardcover. One is already in the hands of a good friend living in Britain from where the books were shipped, while my own copy is still in transit to rural Australia. My friend is already reading it and sending me terrific reviews in the form of regular updates, so I am by now very keen to read it. I also wanted to thank you for writing this book. I have some sense of its scope by watching some of your most recent presentations online. My guess is that Lost in Math stands to become an important historical reference for future science historians, likely a primary source, detailing how late 20th and early 21st century physics took on poorly defined ideas more related to philosophy, hubris and articles of faith, than to traditional methods of empirical science. It would be all too easy to worry about petty and not so petty forms of professional retribution leveraged against you and the mounting personal cost of such a thing. This surely stops a lot of like minded people from taking any serious career risks at all. The conservatism and careerist nature of science culture is clearly antithetical to the method itself so that fostering revolutions in science is harder than it should be and that is a sorry trend repeated over and over in science history, of course. Perhaps for that reason, revolutions in thinking tend to brew for some time such that the first shots fired in the revolution come long before the last shot is fired. So the personal and professional costs stand to be rather high and yet you wrote and published it anyway. I am extremely grateful that you took on this personal risk and wanted to say so.